Rosehaven Cottage: It has a name! Thanks to a very helpful comment left by Mommy Bee in which her father gave some extremely helpful clues as to the variety of my mystery bearded iris, I believe I have finally tracked down a positive identification! I think it's a Wabash! "A look of tailored elegance is the gift this heirloom Iris brings to the bed or border. 'Wabash' was first introduced in 1936 and became a favorite Bearded Iris of the 1940s and '50s. When the sweetly fragrant blossoms open in June, it's easy to understand why. The crisp white of the standards (the smaller, erect petals) poses a striking contrast to the reddish purple of the pendulous falls, which are finished round the edge with a fine, pale piping." So I've got an heirloom iris and I didn't even know it. Congrats on your identified heirloom iris. She's a beauty! How very cool! I'll have to go to that site and find out what kind of iris I inherited out by my compost bin. That is lovely...very unique! You learn something new everyday! Those corsages are soooo pretty! Hope all is well with you Cindy!! 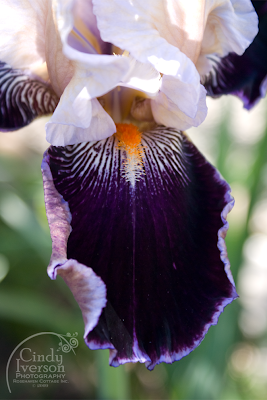 More lickable flowers and colors... love this heirloom iris... it reminds me of Grammy. It's a strikingly beautiful iris. Always nice to identify something for sure. Funny name but gorgeous flower. It's good to be able to put a name to a plant. I bought bearded Irises a few years ago and they were supposed to be a certain variety. Not so, I bought 10, 6 have flowered and none were of the variety I thought I'd bought. I hate it when that happens. Bang goes my colour scheme! It is beautiful. So many of the old varieties get disgarded when the new ones are bigger bloomed/more fashionably coloured/ better disease resistant etc. I am glad you are so happy with an old variety. I think it is very beautiful.